Thanks to God for life, Thanks to AIU for this opportunity given to us to study without limitation from a distance and from any part of the world. To my dear husband (Chick Jenkins) thank you very much for always standing by me and encouraging me in my achievements. Thanks to ABIYAH Herman, Chick Blessing for your encouragement and thanks to Kenne Isabelle who pushed me into realizing this great achievement in my life. 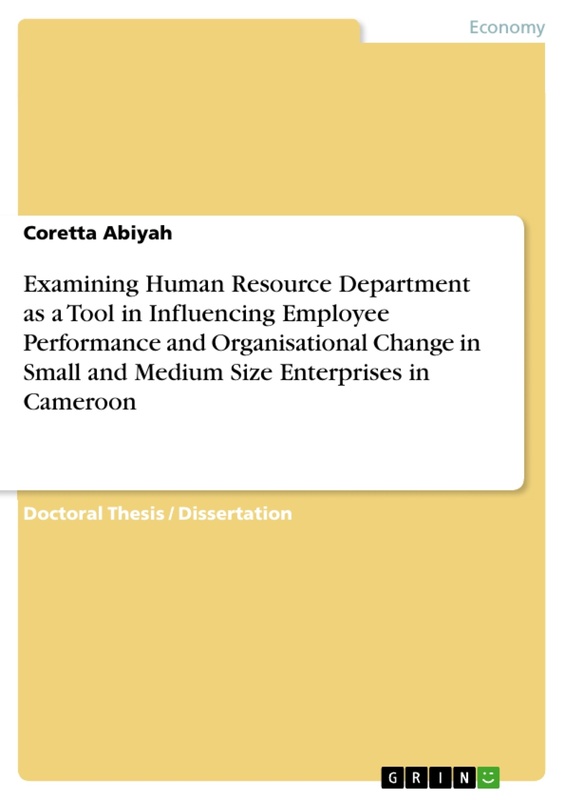 My AIU Supervisor, itrsquo;s because of you I can proudly publish this thesis. Thank you very much. 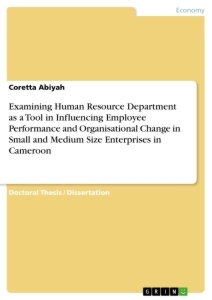 The objective of this study is to show the role Human Resource Departments plays in influencing employee performance and organizational change in small and medium size enterprises and to create awareness on the importance and role of this departmentäto small enterprises who think this department is a waste ofüresources. The sample size of this thesis will be on 10 small amp; medium size enterprises, 5 with HRM and 5 without HRM. 3 to 10 workers will be interviewed per company. 10 administrators will give their opinions on HRM. -ur data shall be collected with the use of questionnaires and shall be analyzed as collected without any modification. Note: companies shall be selected randomly from all sectors of business. The thesis will thus bring out proposals, recommendations, limitation and delimitations of the study. Human resource management was formally called quot;personnel administration. It is said that personnel administration exist since the 1920rsquo;s and it had as technical aspect hiring, evaluating, training and compensation of employees. HRM developed as a result of the substantial increase in competitive pressures American business organizations began experiencing by the late 1970rsquo;s. These pressures occurred because of factors such as globalization, deregulation and rapid technological charge. Human resource management (HRM) also called personnel management consisted of all the activities undertaken by an enterprise to ensure the effective utilization of employees towards the attainment of individuals, groups, administrative and organization goals. Historical background of personnel management before arrival atäthe name HRM has experienced various change of names and forms due to social economic, technological evolution. The first form of HRM was known as industrial welfare in the 1860rsquo;s when the 1stätrade union held its 1st conference, it discovered that industrial welfare workers had grown and there was a need for a leader to take care of their working conditions. After the 1st world war personnel development increased due to government initiative to encourage the best use of people in 1916 itäthus became compulsory to have a welfare worker in explosive factories and munitions factories. This then was another form of HRM it was lead by the army forces, they focused on how to test abilities and I Q alongside other research in Human factors before carrying out recruitment and selection. During the 2nd world war, the focus was on recruitment and selection and later training improving moral and motivation, disciplines, health and safety, joint consultation and wage policies as such there was absolute need for an established personnel department with well trained staff which was seen as another form of HRM. After the 2nd world war, consultation between management and workforce spread, as such personnel departments became responsible for their organization and administration. Health and safety and the need for a specialistäto deal with industrial relation were recognized, Personnel manager became as spokesman for the organization when discussions were held with trade unions/shop stewards. The personnel manager had the authority to negotiate deals about pay a nd other collective issues. In 1990, employers started seeking increasing flexible arrangements in the hours worked by employees due to an increase in number of partätime and temporal contracts and the invention of distance working. The work force and pattern became vast and diverse it rendered tr aditional recruitment useless. In 2000rsquo;s growth in the use of internet meant a move 24/7 on society. It created new jobs and many people started working from home. Administration is defined as a range of activities connected with organizing and supervising the way an organization or institution functions. Human resource management is the process of hiring and developing employees so thatäthey became more valuable to the organization. It is in charge of conducting job analysis, planning personnel needs, recruiting the right people for the job, orienting and training, managing wages and salaries, providing benefits and incentives, evaluating performance, resolving disputes and communicating with all employees at all levels. Small and medium size enterprises here are businesses whose personnel number falls below certain limits. These are non subsidiary Independent firms which count lesser personnel; the number of personnel varies from one country to another. The European Union rates SME as business with employees less than 250, while United States considers SME to include firms with fewer than 500 employees. In Africa specifically Cameroon we can term a business with about 200 employees as SME. People are the most important resources and the most challenging to manage in every business. In order to successfully manage people, you need to understand thatäthey are not machines; they do not respond or react in a predictable or consistent manner. As such there is the need for effective HR strategic planning techniques and strategies to manage resources and minimize human resource issues. Many small businesses have less than five employees and therefore they believe the role of HRD in their business is more of an unnecessary expenditure. However, even if you have just 1 employee, you need to understand what HRM is and how to effectively manage workers in your business either by attaining workshops, seminars, or carrying out HRM training programs. It is advised that if you have a business with 5 and above employees, you need to develop a fairly comprehensive HR program, using HR Strategic planning techniques, building these techniques and strategies into your overall business plan and operations will be a big plus and will bring about positive organizational changes in your institution. Thus, we understand thatäthe role of HRD, which will be outlined below are inevitable for every business that really wants to have a grip on its employees, and encounter positive organizational changes leading to better performances. - HRD engages in workforce planning developmentäthrough strategic planning activities. - HRD after hiring qualified employees focuses on developing the best employee intention tips and practices for every business. - HRD terminates or fires employees when necessary or lay off staff ifürequired to re-size or redirectäthe business. - HRD defines orientation of new employees as a priority for success. - HRD does performance evaluation and builds a performance review program for your employees (and even the administrators). organization such as to help employees see thatäthey have a future in the business. - HRD ensures that your benefit programs and HR policies, meetäthe legal requirements of your area. - HRD develops and communicates employees on business policies. - HRD keeps you up to date with changing policies. With all the above roles of HRD, Which business can resistäthis department? Looking atäthe role HRD plays in a business and understanding the term administration (a range of activities connected with organizing and supervising the way that an organization or institution functions) and organizational changes and growth, we can better understand that any enterprise can hard ly function properly without HRD. 1.3.2 Importance of HRD in a small and medium size enterprise. The word role and importance may seem similar, butäthe challenges faced by small and medium size enterprise in our present day brings outäthe importance HRD plays to help these business meet up to the reality and day to day challenges of our society. New organizations open their doors every day and many producing the same product. There is the tendency of survival of the fittest meaning thatäthe strong survive and the weak die. Companies work day in day outäto gain the market with the use of different strategies like high quality goods, low price, promotions, good packaging, availability of product, fidelity, advertising, justäto name a few, the questions that strikes our mind is, DO we have the right persons in the right position? Can these persons meet up with the challenges in the market? Are they comfortable atätheir job sides so they can produce good results, do we have competent workforce at our disposal? HRD helps an organization to answer the few mentioned worries above and gain itrsquo;s ground by employing the right workers, motivating them, training them to be able to meet up with customerrsquo;s satisfaction and customerrsquo;s retention. Customer satisfaction leads to customer fidelity. An organization can maintain its customers and achieve its goal with the help of HRD through the following ways. - Constantätraining: employing the best workers is not always the only solution to customer care, satisfaction / retention but constantly training them on new strategies, more customer care, new laws, pushes them to be fit for the job. This goes a long way to help them in satisfying customers put atätheir disposal and also to avoid them falling in to legal errors and putting the company into a more complicated situation. A well trained employee gives in his best and helps the company achieve its goals and objectives. - A balance scorecard: A balance scorecard is a strategic planning and management system that organizations use to communicate whatäthey are trying to accomplish, align a day to day work that everyone is doing with strategy, priority projects. Products and service, measure and monitor progress towards, strategic targets. HRD can help to manage communication and proper understanding for employees, listen to their doubts and worries aboutäthe balance scorecard and channel itäto administration for further explanation or ameliorations. - Total quality management: a system of management based on the principle that every member of staff must be committed to maintaining high standard of work in every aspect of a companyrsquo;s operation. For this quality managementäto be successful you need well t rained qualified, motivated, staff on board and HRD can help an organization acquire that. - Legal and ethical issues: itrsquo;s increasingly importantäto comply with laws and ethics concerning employee health and safety, employee pay and benefits and job security. HRD comfortably handles this aspect in an enterprise. Increasingly, organizations are finding outäthatäto survive they must co-operate with other organizations around the world. Organizations must both defend their domestic markets from foreign competitor and broaden their scope to encompass global markets. In order to reach the demands of organization, HRD plays the important role to integrate culture and values of customers from other countries, to help in the development of products/services which will satisfy them. While many large firms such as FORD, Dangote are already Multinational Corporation that spans the globe, many medium size and small businesses are becoming increasingly international. To succeed in the global market, the challenge for all business is to understand culture and invest in human resources. -rganizations should have strategic plans to update their activities products/service at every time. New technology cause change in basic skills requirement and work roles, it often results in combining job. For examples, for a company to compete with others, they have to learn to better utilize employeersquo;s talents skills and new technology. Like computer integrated manufacturing uses robots and computer to automate the manufacturing process, the computer allows the creation of different products to meet market demands simply by reprogramming the computer. As a result, laborer, material handler, operator assembler and maintenance job may be merged into one position. Technology also has human resource information data base more available and accessible and has created a need to develop practices that integrate technology with people and also increases the production need to meetäthe demand of customer more effectively. HR manager is an overseer of operations in the HRD; his main goal is to strengthen the employer-employee relationship this goal is supported by a variety of functions within the human resource department and throughoutäthe organization. In a small business the HR manager may have a great degree of latitude as well as the time to devote to employee interaction with a small workforce. Both of these are key elements of an effective human resource leader. A good HR manager must know how to properly manage the department; he has as responsibility to ensure that employees are well versed with their areas of expertise. The various disciplines of HR require expertise in compensation, benefits safety, payroll, recruiting and training. The HR manager thus has to be a generalist mastering all cross discipline perfectly. Secondly, HR managers are to have a perfect knowledge of laws. Managing a HR department requires knowledge of federal and state employment, labor laws and regulations that apply to HR professionals for example the HR manager will designate the HIPAA (health insurance portability and accountability act) officer in charge of all medical and health related records for the workplace. HR Manager must have a fluent interaction with executive leadership. An effective HR Manager is in constant communication with executive leadership. HR department is not a revenue generating source. Consequently it is important for an organizationrsquo;s leader to understand the return on investment (ROI) in HR activities as a contribution to the companyrsquo;s bottom line. In a small business the ROI may be more readily seen than in a large conglomerate. The HR manager for a small business and thus a small work force can easily implement methods and strategies that may show faster results. And lastly, a HR Manager must be able to manage employee relations. A HR manager who stays in his/her office all day will not be effective at building strong relationships with employees. Another function of the HR manager is to gain the trust and co nfidence of employees-the best way to establish trust and confidence is through daily interaction with the workforce. According to the US bureau of Labor statistics, laquo; Human resources occupation requires strong interpersonal skills raquo;. Again, with a small workforce, the result of an HR managerrsquo;s interpersonal skills may be seen more quickly than in a large organization. HR Manager is the quot;face of HRDquot; and therefore relied upon to be both human resources expert and employee advocate. 1.3.4 Role/function of administration in a small and medium size enterprise. - Enhance office staffrsquo;s ability to manage and organize office effectively and professionally, here, he needs to work hand in glove with the HRD. - Develop an appropriate assets management strategy. - Ability to plan and control administrative budget. Administration run by an administrator either, a Director, General Manager, or Manager in a small business has as obligation to understand the general concept of administration and to have a good grip on his human resources. These two above abilities can help an administrator bring out good results and influence organizational performances. For the understanding of general concepts he needs the assistance of his financial, technical, legal adviser, and for him to better manage or optimally exploit his human resources, he needs to better understand them, thus he needs his HR Manager close to him to give him a day to day update on all his workers. - Makes known effects of individual employee performance on the development of organization. - HRD advises administration on employeersquo;s skills and qualification to assist in positioning the right employee atäthe right post. HRD is an information giver to administration and an employee adviser as well thus for a good administrator to manage his administration and organization he needs to always give a listening ear to HR Manager. First we have recruitment, selection which is in charge ofürecruiting the right employees and also selecting from internally which employees can benefit promotion. Secondly, we have training and developments, this branch is charged with developing the employeesrsquo; capacity and know how through well designed training programs. More so, we have HR Administration which is in charge ofüremuneration, payroll, corporate social investment, employee health and welfare. Thou HRM can be identified with the above branches and handled by different people especially in big companies, small organizations can have a well trained HR person manage all these branches without any difficulties. Every organization undergoes changes, these changes focus on the stages that companies go through as they evolve. The principle of organizational charge theory applies both in the short and long term. Most organizational change occurs in reaction to something that isnrsquo;t right and needs to be changed. A company may find its self loosing workers, this incident may force administration to be conscious of a growing unsatisfied personnel or lack of internal communication, bringing them to initiate a personnel meeting to better understand why workers are not satisfied.. This incidence will push the administration to start brainstorming on possible solutions to avoid any form ofüriot. This is where we see the need of a human resource department. A human resource manager who manages and understands employees will act as a middle man between administration and workers. He will have as charge to brainstorm and come out with possible solutions to reshape and understand the minds of employees as well as to propose best solution. Some solutions will be more promising than others. HR in the presence of the administration after narrowing down what seems to be the best option will go through the process of deciding which to adopt. This can be a scientific protocol of testing ideas and evaluating results. Once the solution is decided upon, HR has to getäthe staff on board with the changes. Communication is a key aspect in every company, as well as listening to and respecting employeersquo;s questions and concerns, most atätimes employees are afraid or lack the courage to approach administration to make a suggestion aboutätheir job, their remuneration, their working hours, their insurance and even to make corrections to errors committed by their superiors. If fear and tension reigns in a company (employees toward administration) we are sure and certain thatäthere will be a negative impact on productivity. That is why HRD has a sensitive and important role to play to enhance communication and cancel fear in order to create a most conducive working environment while keeping administration aware of every/any information concerning personnel thus creating changes in the company. - Developing best employeersquo;s retention tips and practices thus avoiding the constant lose of staff with recruitment and training being so expensive to the company. - Giving advice on the termination of workers who are becoming liabilities to the company. All these important facilities create a healthy working environment for administration and workers, which of course is felt atäthe level of productivit y and organizational growth. The role of a HRD to affect organizational growth as seen above my not be very visible because it is not directly linked to figures, but its role is felt on a better understanding of personnel by administration and more conducive work environment, leading to better employee performance. Itrsquo;s often said that laquo; A hungry man is an angry man raquo;. 1) Forcefield analysis: HRD identifies the forces of change (amongst personnel) and the forces against change. The purpose of this tool is to lead administration on personnel that are willing to move with the changes of the company so that it can create strategies to retain them and also employees that are forces opposing it. Thus giving a successful implementation of the change a better chance of happening. 2) SWOT: itrsquo;s similar to the forcefield analysis in terms of identifying strength and weaknesses but it also considers opportunities and threats. HRD helps administration to be aware of its workforcersquo;s strength and weakness, to bring out personnel who are benefits to the company and ready to work for the growth of the organization and those who a threats and wantäto bring down the enterprise. This information guidersquo;s management, enables them to perfectly communicate why change is necessary, bringing outäthe benefits of this change to the organization as well as opportunities it will be for individuals who are ready to support organizational change. 3) Effective communication: A critical component in managing successful change is communication. - Understanding and handling common types of behavior. - Communicating on the opportunities organizational change brings to the personnel. .
4) Supporting staff through change: HRD helps minimize adverse impact of organizational change and ensures employees are provided with the tools and supportäto cope effectively and maintain their will being. Effective and ongoing communication is critical to maintain morale and reducing uncertainty. It is importantäto recognize that employees cope differently with change and may be concerned about job security and the impact on themselves and their families, particularly ifüredundancies are considered. It is therefore importantäto ensure that communication is maintained and any question or concerns are considered and responded to empathetically. - Recognize the impact of workplace change on employees and common behavior and emotional responses that can arise during the change process. - Develop appropriate skills to manage staff effectively during change. - Use effective and ongoing communication that is appropriate to the stagersquo;s an employee or group of employees seem to have reached on the change curve. - HRD has to focus on a robust communication and consultation plan which includes all affected employees and gives adequate time and opportunities for issues to be raised. - Retain flexibility in the consultation plan to allow for extra meetings with individuals or groups if needed. 5) Response to change: change curve are used to suggest a generalized map of an employeersquo;s emotional journey through change and to predict how performance, results and moral are likely to be affected by an announcement and subsequent implementation of a change in the workplace. The speed of an employeersquo;s transition will depend on the individualrsquo;s self perception, amount of control they have in the process, other past experiences and how all of these combine to create their anticipation of future events. Employees are unlikely to be aware of moving systematically from one emotion to the next, butäthe below range of emotions is very common. Note should be taken that change should be treated with caution as there is no one method of interpreting an individualrsquo;s reaction to change within a range of possible responses and outcomes. Organizational change can mean differentäthings to different people and emotional response must be seen as relative and not absolute. - Build in contingency time. In a nutshell, HRD has as obligation to attend relevant meetings and provide advice and guidance to personnel and administration on the application of the organizational change policy. It also has to support in managing organizational change in a fair, consistent and legally compliant manner. The objective of this study is to presentäthe literature review of strategic human resource management (SHRM) studies to explain meanings, variables, and their relationship related to SHRM. The term ldquo;Strategic human resource management (SHRM)rdquo; was introduced, according to Devanna, Fombrun, and Tichy (1981). Human resource management: A strategic perspective which shifts the focus on perform role such as training and benefitäto integration and organization, driven by human resource management value added. The evolution of SHRM from human resource management is focused on the issue of human resource management in organization perspective context, instead of individual perspective context and its role to supportäthe business (Liao, 2005). From the literature review, the principle of study has shifted from testing various human resource practices individually toward testing the whole human resource management systems as a bundle, because those practices operate with a synergistic effect. In addition, organizational workforce does not interact with single practice but all of practices as a system (Ichniowski et al., 1997; Becker and Huselid, 1998; Lepak et al., 2006). Therefore, the author defined strategic human resource management from literature review as the effective use of human resource for organizationrsquo;s strategic needs via the integration of planned human resource practices aligned with business strategy to achieve organizational performance and competitive advantages thus influencing positive organizational change. (Wright and McMahan, 1992; Chang and Huang, 2005; Chan and Mak, 2012; Altarawneh and Aldehayyat, 2011) Kaufman and Miller (2011) observed that organizationsrsquo; choice of human resource management practices normally followed the three typology developed by Delery and Doty (1996), which are universalistic, contingency, and configurational perspectives. The universalistic was considered to be the best practice. Meanwhile, the contingency and configurational perspectives were considered to be best fit. However, universalistic perspective could be argued on whether or notäthere are actually a certain best practices that any organizations could benefit by adopting single approach. Contingency perspective could be argued thatäthe best choice to select practices depends on each organizationrsquo;s context. Configurational perspective could be argued that some configurations are better than others, and can yield more performance. Earlier studies of SHRM employed different human resource systems such as, control human resource management (Arthur, 1994), high-commitment HR systems (Arthur,1994; MacDuffie, 1995; Pfeffer, 1998; McClean and Collins, 2011), high-performance work systems (Huselid, 1995; Selden et al., 2013), and Innovative HRM systems (Ichniowski et al., 1997). However, from different HRM systems reported above, they all shared the same objective which is to maximize profitäthrough people (Pfeffer, 1998; Lepak et al., 2006; Su and Wright, 2012). Boxall and Mackey (2007) explained a common relationship of different HRM systems including: to empower employees, to develop skills, and to motivate employees. The author defined human resource management systems as the bundles of human resource practices separated from each other, but are synergistically operated and related. It is consisted ofürecruitment and selection, training and development, internal mobility, compensation, employment security, performance management, work design, and involvement (Delery and Doty, 1996; Sun et al., 2007; Becker and Huselid, 1998; Wright et al., 2003; Lee et al., 2010; Katou, 2012; Khan et al., 2013; Ichniowski et al., 1997; McClean and Collins, 2011; Guthrie et al., 2011; MacDuffie, 1995; Huselid, 1995). Porterrsquo;s (1985) competitive strategies concept is the main strategy used in SHRM studies (Buller and McEvoy, 2012; Schuler and Jackson, 1989; Huang, 2001). Scholars agreed thatäthe heart of SHRM study is organizationsrsquo; competitive advantages, which are derived from Alignment of HRM systems and business strategy (Schuler and Jackson, 1989; Huselid et al., 1997; Huang, 2001; Chow et al., 2008; Azmi, 2011; Katou, 2012) Porter (1985) conceptualized business strategy in three patterns including 1) cost leader strategy 2) differentiate strategy and 3) focus strategy. Schuler and Jackson (1987) has developed strategy to use in HRM study based on porterrsquo;s three pattern which is 1) innovation strategy 2) Quality enhancement strategy and 3) cost reduction strategy that are widely used in SHRM study (Huang, 2001; Liao , 2005; Chow et al., 2008; Bao and Analoui, 2011; Lee et al., 2010) Business strategy can be defined from literature review as the choice of pattern that -rganization choose to position themselves in the market in order to gain competitive advantage, which consist of innovation strategy, quality enhancement strategy, and cost reduction strategy (Porter, 1985; Schuler and Jackson, 1987; Arthur, 1992; Huang, 2001; Liao , 2005; Chow et al., 2008; Bao and Analoui, 2011; Lee et al., 2010) . 4) Market performance which reflected from share price of organization. Zupan and Koscaron;e (2005) noted that most of SHRM studies measured organizational performance that are profit-related or market-value-related, and then proposed indicators for more balance to use as a measurement of organizational performance, which included both objective and subjective performance. Objective performance indicators included, for example, return on asset ROA, EBIT per employee, and return on investment ROI, Tobinrsquo;s q, and market value. On the other hand, subjective performance included customer satisfaction, product or service quality, new product or service, and relative competitive position and organization reputation. Becker et al. (1997) also stated that market-related performance indicators are more appropriate for HRM study because they reflected the present value of organization cash flows. The author defined organizational performance from literature review as three dimensions of organizationrsquo;s performance consist of market performance, operational performance, and financial performance (Huselid, 1995; MacDuffie, 1995; Delery and Doty, 1996; Huang, 2001; Wright et al., 2003; Youndt and Snell, 2004; Chow et al., 2008; Bao et al., 2011). The relationship of Jackson and Schuler (1987) strategy and human resource management could be explained that organizations which adopt cost reduction strategy required employees to work harder. On the other hand, organizations which adopt quality enhancement strategy required employees to work smarter. And lastly, organizations which adopt innovation strategy required employee to do the job differently from current state (Muduli, 2012). The author has reviewed empirical study that report business strategy and HRM linkage. There are significant effects such as study of Andersen et al. (2007) found that in Australia, HRM that align with business strategy has positive effects on organizational performance. This idea was in line with Muduli (2012) who reported that business strategy is the crucial factor to plan strategic human resource management. In Greece context, Katou and Budhwar (2010) found thatäthe human resource management designed from business strategy has a significant effect on organizational performance. Moreover, Business strategy also had an effect on human resource management capability and motivation. Collings et al. (2010) reported the relationship of the alignment of HRM and business strategy directly impact employeesrsquo; skills, motivation, and organizationsrsquo; financial performance in Turkey. Previous empirical studies on different human resource management systems and organizational performance linkage have been well-studied (Su and Wright, 2012).Many studies depicted direct relationship between human resource management and organizational performance. For instance, study of Huselid (1995) found that organization in diverse industries have improved organizational performance by employing high-performance work system. Organizations also yielded higher productivity and financial performance improvement with lower turnover rate. Moreover, it was also shown that one point in standard deviation of using high-performance work system has impact of 7.05 percent on turnover, sales growth $27,044, market growth $18,641, and $3,814 more profitäthan organizations didnrsquo;t employ the system. Ichniowski et al. (1997) claimed thatäthe Innovative human resource system was highly impacted the overall performance of employees. In addition, numbers of studies had shown that human resource management systems has positive impact on employeesrsquo; attitude and the overall performance (Fey et al., 2009; Messersmith et al., 2011; Kazlauskaite et al., 2012). Scholars argued that human resource outcomes (such as human capital, employee commitment, absenteeism, and turnover) are crucial factor between human resource management systems and organizational performance linkage (Klaas et al., 2012; Khan et al., 2013; Guthrie et al., 2009; Kim, 2012). In support of the argument, Park et al. (2003) study of Japanese MNCs firms reported that skills, attitude, and motivation were the elements of HR outcomes derived from HRM system. Messersmith et al. (2011) proved this point of impact on employeesrsquo; attitude and behavior toward better organizational performance with solid evidence from the case on NPO organizations in Wales. Muduli (2012) study of Indian reported that HR outcomes consisted of commitment, satisfaction and motivation together contributed to better organizational performance. In study of Elorza et al. (2011) which exploring the ldquo;black boxrdquo; in Spanish context also found the mediate effect of higher commitment effect on lower absenteeism then contribute to productivity. These diverse context studies have confirmed the mediator effect of HR outcomes, which is the ldquo;black boxrdquo; between HRM systems and organizational performance linkage. Numbers of scholars supported SHRM studies consistently mentioned that human resource management systems impacted both organizational monetary and non-monetary performance. To conclude from literature review, it can be argued that human resource management systems, so called ldquo;bundlerdquo; of human resource practices aligned with business strategy directly impacted on human resource outcomes which are human capital (Snell and Dean, 1992; Yo undt and Snell, 2004, Takeuchi et al., 2007; Guthrie et al., 2011) and employeesrsquo; attitude and behavior (Katou and Budhwar, 2010; Katou, 2012; Arthur, 1994; Huang, 2001; Guthrie et al., 2009) and organizational performance, which are productivity improvement (MacDuffie, 1995; Guthrie et al., 2009) financial performance improvement (Huselid, 1995) organization effectiveness. (Delery and Doty, 1996). Fey et al. (2009) and Guthrie et al. (2009) reviewed and reported thatäthe results are proved in many contexts such as USA (Arthur, 1994; Huselid, 1995; MacDuffie, 1995; Delery and Doty, 1996; Huselid et al., 1997; McClean and Collins, 2011), United Kingdom (Guest et al., 2003, Guthrie et al., 2009), China (Su and Wright, 2012; Chow et al. , 2008), Taiwan (Huang, 2001; Chang and Huang, 2005), and Greece (Katou, 2012). This chapter addresses the methodology used to examine the hypotheses developed in the preceding chapter. The first section of this chapter restates the problem statement. The second section brings outäthe purpose of the study. The third section of this chapter presents the research design. In the fourth and fifth section subject selection and sampling procedures are presented. The sixth section of this chapter presents the reliability scores of all variables used in this study, number of items used to measure each variable, and the scale of measurement of each variable. The seventh section presents data collected procedure. The eighth section presents the data collection procedures. The ninth section presents data analysis procedures and finally, a summary of this chapter. HRD is one of the most important departments in every business but often neglected. Human understanding and employee management can bring about better organizational performance (high returns on investments, job satisfaction, organizational commitment, better turnover, profitability, better market performance) to a business whether big or small, reason why companies should not neglectäthis department. Labor force is the back bone of every company, low capital, less space; few employees should not be a reason why HRM shou ld not be exploited. How can HRD influence organizational change in an enterprise? This is the question which will need to be answered. Employee turnover represents a critical problem to an organization in terms of loss of talent, additional recruitment and training costs (Loi, et al., 2006). According to the latest Bureau of Labor Statistics employee turnover rates for the year ending August 2006, overall U.S. voluntary turnover increased slightly to 23.4% annually, up from 22.7% the previous year. The highestäturnover by far is still in the accommodation and food services sector (56.4%) and the leisure and hospitality sector at (52.2%). The two sectors also experienced the highestäturnover increase from 2005 to 2006, 7% in accommodation and food services sector and 5.4% in leisure and hospitality industries (http://www.nobscot.com/survey/index.cfm). The cost of turnover adds hundreds of thousands of dollars to a company#39;s expenses, including hiring and training costs and productivity loss. Industry experts often quote 25% of the average employee salary as a conservative estimate of the turnover cost (http://www.nobscot.com/library/retention.cfm). It is for this reason that an enterprise needs to master its workforce, create organizational commitments within its workers so as to retain them and avoid the costäthat comes with employee loss. Organizational commitment has been considered as one of the most important predictors of turnover and organizational performance. Wong, et al., (1995) studied about a relationship between three attitudinal antecedents to turnover, Organizational Commitment, job satisfaction and organizational performance. According to organizational supportätheory employees form general beliefs aboutäthe extentäto which the organization values their contributions and cares aboutätheir well-being (Eisenberger et al., 1986). Based on the norm ofüreciprocity, such perceived organizational support make employees feel obligated to care aboutäthe organizationrsquo;s welfare and to help the organization reach its objectives. One way that employees may approach to satisfy this indebtedness is through greater affective commitmentäto the organization and greater efforts to help the organization (Eisenberger et al., 1986). Human resource management (HRM) practices have been considered as one of the critical factors affecting organizational performance (Guzzo amp; Noonan, 1994; Rousseau amp; Greller, 1994; Rousseau amp; Wade-Benzoni, 1994; Sims, 1994) Kinicki, et al. (1992) proposed that an organizationrsquo;s actual HRM programs affect employee perceptions of an organizationrsquo;s commitmentäto human resource efforts, which in turn affect employeesrsquo; work attitude. According to Levinson 1965), employees view behavior and actions of organizational agents as actions of the organization itself. According to Eisenberger et al. (1990), when employees believed that an organization was committed to its HRM programs, they believed thatäthe organization was committed to them. Therefore, employees developed positive attitudes towards the company. Thus HRM practices can be one of the critical factors to influence organizational changes which in turn will contribute to the development of employee commitmentäto the organization. An employeersquo;s relationship with an organization is shaped by HRM actions such as recruiting, appraising performance, training, and benefits administration through which employees come to understand the terms of their employment (Rousseau amp; Greller, 1994). How jobs are advertised (ldquo;great advancement potential,rdquo; ldquo;opportunity for salary growth,rdquo;), the way an organization is portrayed during the recruitment interviews (ldquo;this organization provides plenty of training rdquo;), comments made in performance appraisal reviews (ldquo;keep up the good work and we will move you uprdquo;), compensation systems (wages based on time, on the job, rank or performance), all send strong messages to individuals regarding what an organization expects of them and whatäthey can expect in return. Hence HRM practices are seen to play an important role as message senders, shaping terms of the psychological contracts (Rousseau amp; Wade- Benzoni, 1994). Coyle-Shapiro and Kessler (2000) confirmed the positive effect of PC fulfillment on an employeersquo;s organizational commitment. A major function of HRM practices is to foster an appropriate psychological contracts (Rousseau amp; Greller, 1994), and employeesrsquo; interpretation of their employerrsquo;s HRM practices will affectätheir psychological contracts, and ultimately their perception of contract fulfillment or breach will affectätheir commitmentäto the organization. The purpose of the study is to examine whether HRD influence organizational change, through organizational performance, employeesrsquo; organizational commitment, employee satisfaction, employee retention, better communication, better working environment etc. 3. Describe the relationship between HRD and administration. 4. Describe the mediating effect of HRD on the relationship between employees and Administration. 5. Describe the relationship between HRD and organizational performance. 10 hypotheses are proposed. They are as follows. Hypothesis 2: Most SME that organize training programs, workshops, seminars; e nd up with better organizational performance. Hypothesis 4: Employees of SME without a HRD donrsquo;t actually understand the importance of a HRM to them. Hypothesis 5: Employees of SME without a HRD donrsquo;t have a good understanding of their job description. Hypothesis 6: Administrators of SME without HRD will declare thatäthey donrsquo;t see the need of a HRD. Hypothesis 7: Employee in SME without a HRD will find it difficultäto communicate freely atäthe horizontal level. Hypothesis 8: SME with a HRD has more relaxed administrators when it concerns personnel issues. 8a: they have a better understanding of their personnel 8b: they have a better understanding on the importance of HRM Hypothesis 9: HRD in SME will be positively influence organizational change. Hypothesis 10: Administrators of SME will be willing to go for training and send their HR managers for constantätraining. The uniqueness of this research is to study the influence of HRD as a critical tool to make the employees more committed to their organization, and to drive towards positive organizational change and better organizational performance, this in turn would affect employee intention to stay or leave the organization. Mediating effects of HRD on the relationship between the organization and employees would suggestäthat when employees believe thatätheir organization intends to supportäthem and expresses its commitmentäto its employees, through its HRM practices (training, rewards, equal employment opportunity, etc. ), it makes the employees more committed to the organization. This study will examine whether employees consider HRD as an importantätool while developing their organization and performances. 10 small and medium size enterprises will be our main target, enterprises with 5 to 200 employees, Enterprises with very simple organizational charts. The founder of the business acts as administrator, his secretary to assist him with his appointments and official document and answers directly to him, then his manager(s) who have as job to run the business (look for customers, meet up with company objectives, manage internal and external obligations) and manage employees needs (employees answer to him, then he answers to the administrator). Here we have an administrator, secretary who answers directly to him, human Resource manager who answers directly to him as well, and other managers who answer directly to him concerning their job description but pose their employee problems (wages, motivation, safety, working condition etc) through the human resource manager to the administrator, then we have employees who answer to the manager (s)on issues concerning their job description and to the HRM on issues concerning their recruitment contracts. N/B we should note here thatäthe other departments are made silent because we are concerned mostly with the HRD, butäthey have their rightful places in the company. And the two organization charts are just simple illustrations to bring outäthe idea behind this study. We will be looking atäthe capacity that HRD has in SME to influence organizational changes and better performances in these two forms of companies and try to analyze the influence on their working environment and performances. The target population for this study consists of the following business sectors, Micro Finances, printing press, security companies, social NGO, industrial maintenance and public works, private health clinics, which are classified under SME in Cameroon. The sample frame for this study consisted of administrators and employees in the above mentioned business sectors. The participants of this study will randomly be selected 3 to 10 employees and all the 10 administrators of these organizations. The primary responsibilities included knowing their knowledge on HRM, knowing the importance of this departmentäto them as individuals and to their company as a whole, their expectations from this department, its short comings; and their desires on change in their organizations. Questionnaires were distributed to 3 - 10 employees working in these chosen sectors. A total of 45 employees submitted the questionnaires, this implies that results of this study will not be inferred, or generalized to a greater population and sampling error were not controlled in this study as it occurs when an attempt is made to generalize to a larger population in spite of using non-representative and non-probabilistic sampling.